Pontoon is a web application, which is great. You can run it on almost any device with any operating system. You can be sure you always have the latest version, so you don’t need to worry about updates. You don’t even need to download or install anything. There’s just one particular occasion when web applications aren’t so great. Mostly that means the game is over. But it doesn’t need to be so. Application caching together with web storage has made offline web applications a reality. 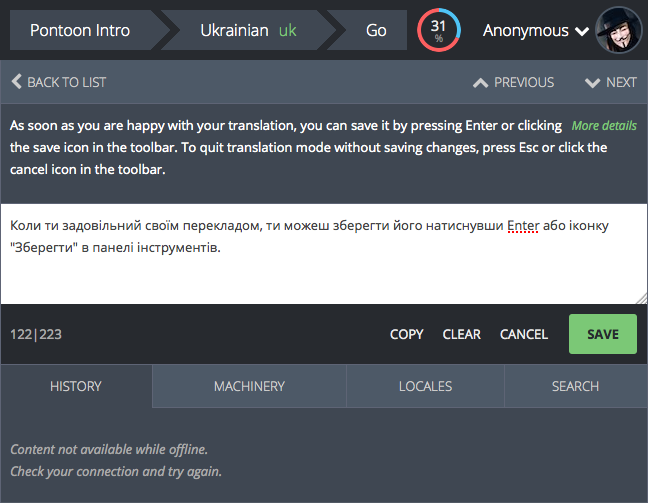 In its latest edition released yesterday, Pontoon now allows translating even when you’re offline. See full changelog for details. There are many scenarios where offline localization is the only option our localizers have. Decent internet connection simply cannot be taken for granted in many parts of the World. If it’s hard for you to belive that, visit any local tech conference. Or, if you started localizing at home, you can now continue with localization on your daily commute to work. And vice versa. The way it works is very simple. After Pontoon detects you no longer have a connection, it saves translations to localStorage instead of server. 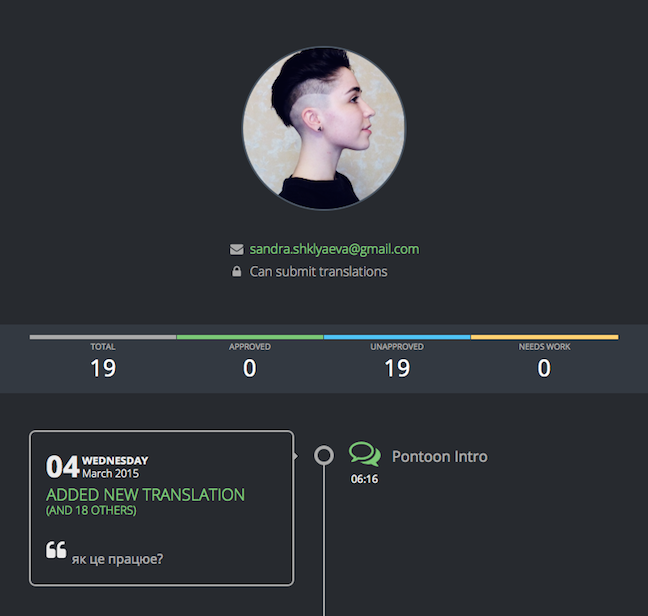 Once you get online again, translations are stored to server. In the meantime, connection dependant functionality like History and Machinery is of course unavailable. Offline mode was single-handedly developed by our new contributor Sandra Shklyaeva. She just joined Mozilla community and has already fixed one of our oldest bugs. She’s attacking the bugs everybody was pushing away. I can’t wait to see what the future holds (shhhhh)! I was exploring some JS API on the developer.mozilla.org when I noticed pretty tabzilla on the top. I clicked it and my chrome became unresponsive completely XD. Maybe it was just a coincidence… Anyway, the tabzilla has caught my attention and that’s how I found out about Get Involved stuff in Mozilla. If you also want to get involved, now you know where you can find us!